Perhaps you have wandered past our stand, The Foragers’ Co-op, at the new Lancaster East Side Market at Musser Park and been bemused by what was displayed on our tables. We’ve had a wide variety of edible wild plants for sale, everything from birch twigs (smell that wintergreen aroma!) to various roots, leaves and even stinging nettle! “Stinging nettle, what do you do WITH THAT?” seems to be a common query of many passersby. It’s a delicious green vegetable, makes a wonderful tea and a hearty nutrient-filled broth for soup. Additionally, stinging nettle is used by many people to help with seasonal allergies and joint pain. And that’s just a start! One great reason to eat wild foods is that they are extremely good for you! Wild-grown foods are typically more nutrient-dense than cultivated vegetables (though eating organic veggies is also a brilliant plan for staying healthy). Eating wild foods gives our bodies micronutrients like trace minerals that are not as readily found in cultivated foods, plus loads of vitamins. Stinging nettle, for instance, provides copious amounts of iron, calcium, as well as vitamins A, K, and D.
Wild edibles also add highly beneficial variety to the typical American diet. Many Americans only consume five “vegetables” on a regular basis (I put “vegetables” in quotes here because that list includes corn, potatoes and tomato sauce). Scientists have shown that our health is best supported when we eat a wide variety of brightly colored vegetables. Wild veggies like long leaf plantain, burdock stalks, violet greens, dandelions, nettles, and more all have the potential to help bring Americans into a healthier state, like the peoples whom were living here prior to European contact. The American Indians were recorded by the Europeans as being tall, strong, and without blemish or disease. Their diets were rich in wild foods. Eating wild foods from The Foragers’ Co-op also supports our efforts at Susquehanna Permaculture to tend local marginal lands, woodland areas, and meadows with the ethics of permaculture as our guide. Those ethics are: earth care, people, care, future care. 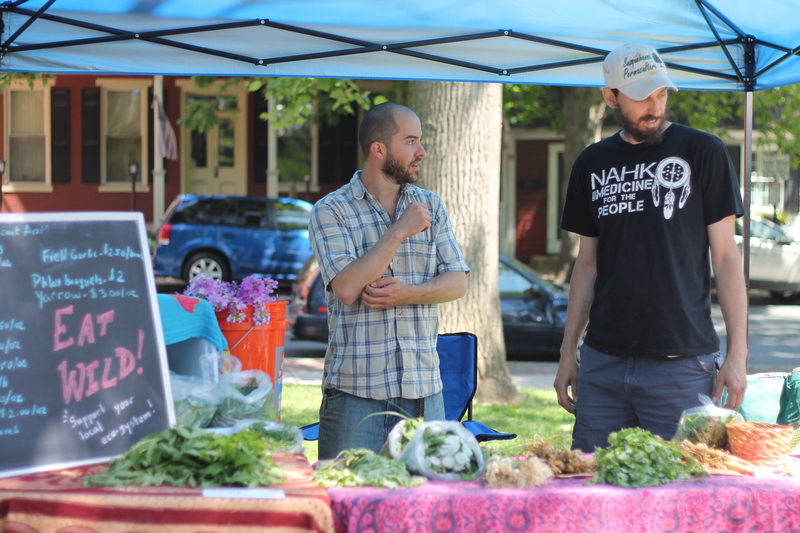 A significant portion of the proceeds from The Foragers’ Co-op market stand and sales to local restaurants goes into our efforts to “rewild” these areas through the following activities: planting edible species that once thrived in this region, transplanting important species to appropriate areas in order to spread those species to more parts of the region, removing rampantly dispersive plants that choke out important species, rebuilding soil, careful pruning to encourage growth, and ethical harvesting of abundant species that proliferate here. Recently, we have reintroduced Apios americana (common name hopniss or ground nut) to a local woodland area. Along with that we’ve transplanted wild leeks and planted wild strawberries in the same area. As we continue to work on these efforts our region will become more ecologically diverse and abundant in wild edibles, which will benefit all who live here. Eating wild foods is an increasingly popular thing to do as is evidenced by the number of top level chefs worldwide who seek out foraged ingredients to fill out their creative menus. These ingredients are fresh, unique, delicious and healthful. Foodies on a budget can shop at our Forager’s Co-op stand to create their own delicious recipes or perhaps try one of ours (provided on our website and at our stand). Eating foods from our stand or at local restaurants supports the local economy, increases the biological diversity and health of our region, and adds nutrient-rich diversity to one’s diet. Eating wild is a win, win!